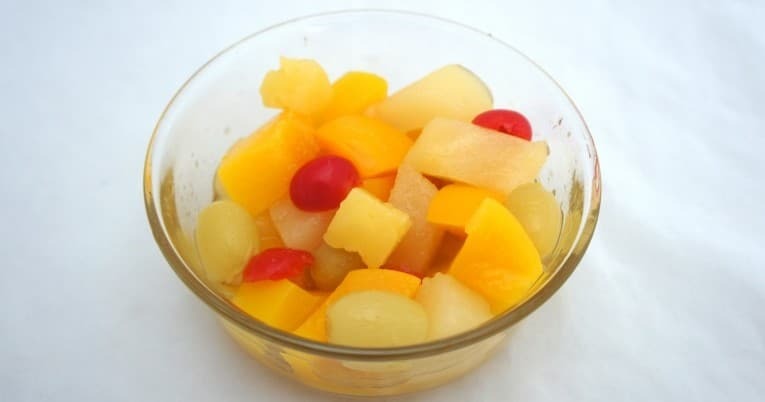 Chunky mixed fruit in peach and pear juice shall be prepared from Yellow Clingstone peaches, Bartlett pears, Thompson seedless grapes, pineapple segments and halved cherries artificially colored red. As the name implies, Chunky Mixed Fruit in 100% Juice is packed in a moderately opaque packing media to produce a chunky mixed fruit pack with a characteristic sweet flavor and an appetizing appearance. Peaches, Pears, Water, Grapes, Peach Pulp and Juice, Pineapple Sectors, Pear Juice Concentrate, Halved Cherries Artificially Colored Red with Carmine, Ascorbic Acid (Vitamin C) to Protect Color, Naturally Derived Citric Acid. *The % Daily Value (DV) tells you how much a nutrient in a serving of food contributes to a daily diet. 2,000 calories a day is used for the general nutrition advice. Stay up to date on New Items, Industry News, Crop Updates, plus much more by joining our mailing list!